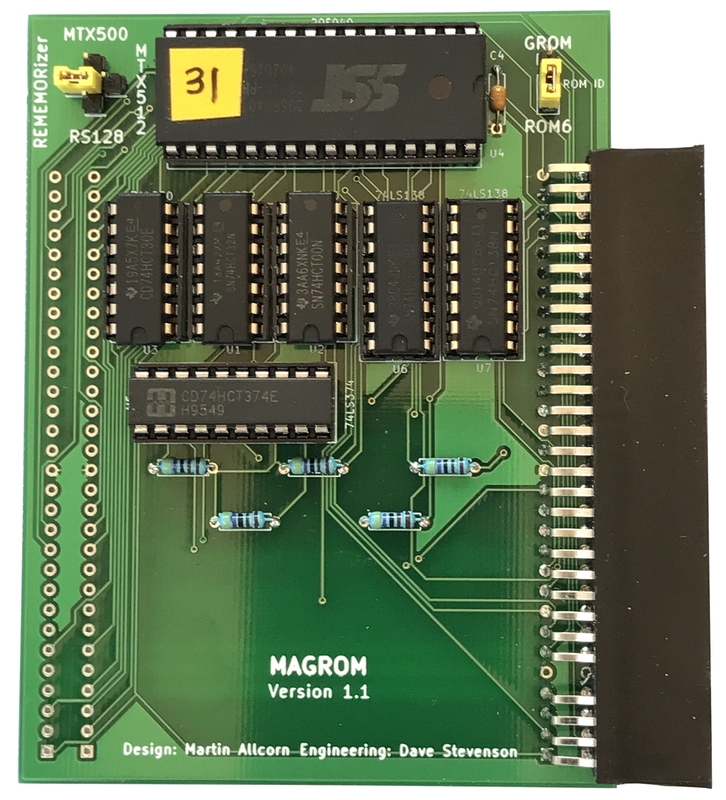 "Out of the box", MAGROM Version 1 wasn't compatible with Andy Key's REMEMOrizer due to the way that REMEMOrizer makes 384K of RAM available in ROM mode, more than a standard MTX was able to provide and more than the original MAGROM design was able to cope with. This was particularly problematic for users who had removed the original OS ROM to allow REMEMOrizer to provide Andy's enhanced OS ROM as the original ROM would have needed to be replaced to allow MAGROM to work. 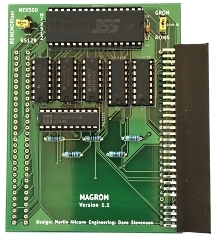 It was possible to patch the MAGROM board to allow it to be used with REMEMOrizer, these patches have now been incorporated into the standard design. 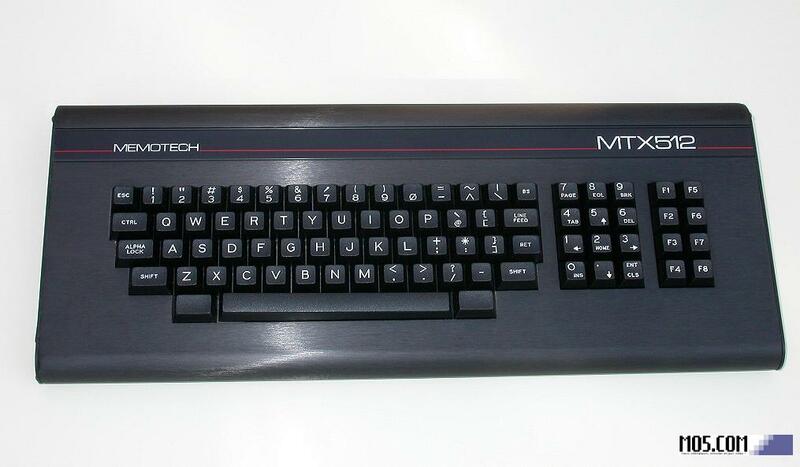 The MTX computer was designed to support plug-in Games ROMs that used the interface GROM signal to enable Games ROMs with an ID of 7. 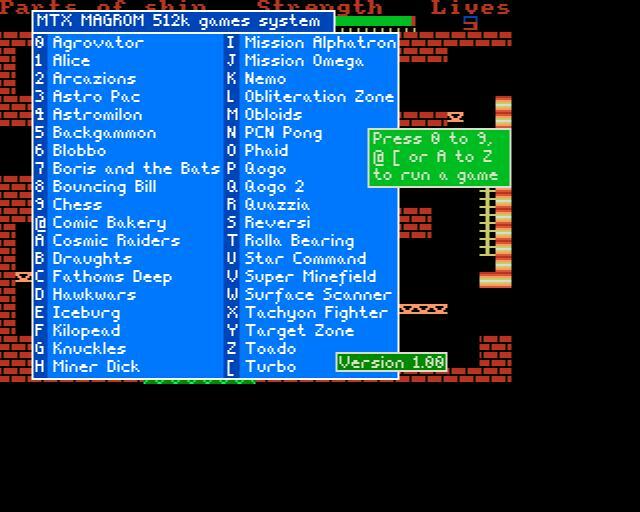 MAGROM was designed to use the same ROM ID to provide multi-game support. However, some MTX owners with foreign language MTXs were unable to use MAGROM due to the way that Memotech implemented foreign language support on some, but not all, regionalised MTXs. The MAGROM design has been modified to allow the user to select either ROM 7 or ROM 6 as required. The HC32 chip, U1 on the KiCad schematic, is used to combine the Z80’s active low write (WR) and I/O request (IORQ) signals into a combined (active low) IO write signal and also read (RD) and memory request (MREQ) into a single memory read. The other 2 gates are unused, and their inputs tied to 0v. On start up, the MTX OS scans the paged ROM space at 02000h looking for the auto start signature, if it’s found, then the ROM is entered by a jump to 02010h. The controlling ROM therefore has to be paged in for the address block 02000h to 03fffh. The easiest way to do this is use the GROM signal on the edge connector which goes low when ROM page 7 is accessed and was originally intended for use by games ROM expansion packs. MAGROM V1.0 operates using this signal. However, Memotech re-purposed the signal to activate the piggyback ROM in some of the non English language MTX systems. This unfortunately prevents MAGROM 1.0 working. Version 1.1 of the board is designed to work around this by allowing the control software to appear in ROM page 6 instead. This is done by the extra HCT138 chip, U7. The 3 address selectors, on pins 1-3, are fed with R0-R2 from the edge connector, and the chip enables are connected A13 to the active high pin 6, while A14 and A15 go to the active low enables. This ensures the output is low only in the correct memory region. Any of the ROM pages from 2-7 could be used this way, but 6 was chosen so as not to clash with the maximum amount of other MTX hardware. The Y6 output is therefore fed into the ROM6/ROM7 jumper. GROM is fed into the ROM7 side. In systems without the language ROM U7 can be left off entirely and the jumper set to use ROM7 as in version 1.0. 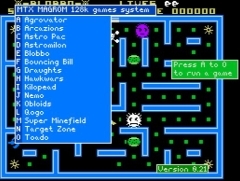 In addition to providing the control software the ROM also has to hold the game images. This is to save board space and cost, as otherwise space would have to be found for a 28pin 8k EPROM as well as the 512k data ROM. It does reduce the space available for games by 8k but the remaining 504k turned out to be more than adequate. For the MTX500 it’s page 0, for the MTX512 it’s page 1, and the RS128 it’s page 3. Andy’s REMEMOrizor expansion provides a LOT of extra memory for basic, though it too has a half page, but on page 11. The version 1.0 MAGROM needed some “yellow wire” mods in order to work with REMEMOrizor. V1.1 effectively has those mods built in. The data part of the ROM is paged in in the RAM memory map between 04000h and 7FFFh, so as not to cause a bus clash, the page used has to be adjusted manually depending on the model. The software expects there to be RAM above the ROM which prevents the board from using page 11 on all systems. The HC138 U6 has A14 connected to the active high enable, and A15 and P2 connected to the active low, P0, P1 and P3 are connected to the address selectors. This makes it possible to place the data rom in any of the pages 0-3 or 8-11. The + shape jumper on the board replaces the T jumper on version 1.0. It is used to select which one of the 4 outputs Y0, Y1, Y3 or Y7 (for page 11) is treated as the second ROM select signal. Whichever ROM select is used, it’s connected to one of the NAND gates on the HCT00, U2, along with the ROM 6 or ROM 7 signal from the other jumper. That is then run through a 2nd NAND gate configured as an inverter to form the combined ROM select signal. In order to prevent any part of the rom paging in while the system is running in an all ram configuration, the RELCPMH signal from the page port is combined with the rom select in U1 the quad 2 input OR, if the ROMs are supposed to be paged out RELCPMH is high and so prevents the ROM select from going low. The data ROM has to be accessed through a 16k window in memory, so needs to use a paging system I’ve used an 8 input NAND with A2 inverted, U3 to detect 0FBh on the lower part of the address bus. The port address is combined with the IO write signal form U1 so that the paging register is only selected by an IO access and not a memory access that happens to have &FB in the lower part of the address. Using one ROM for 2 jobs adds in a complication, when accessing the rom to run the control program, the upper address bits all need to be zero to point to the correct segment. However, in data mode the outputs need to be active as all of the ROM needs to be accessible. Using a 3 state octal flip-flop as the paging register, with pull down resistors solves this. A spare gate on the HCT00 (U2) inverts A14 to provide the active low enable on the HCT374 when the address is in the data ROM area, but also disables the outputs then the control part of the ROM is accessed and allow the resistors to set the upper part of the ROM’s address bus low. All the games chosen were written to run on the MTX500 so the presence of ROM in the memory map doesn’t cause any issues, as that area’s is empty on the 32k system. Otherwise known as a mistake! 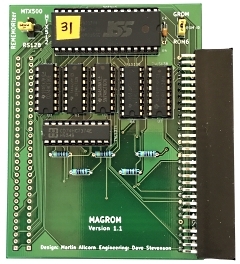 The layout for the original MAGROM PCB was done using an earlier release of KiCAD, by the time had I revised the layout for Version 1.1, I had upgraded to a later version of KiCAD. The upgrade "broke" some of my KiCAD footprints and I to redo them, one of the affected components was my MTX Edge Connector footprint. Unfortunately, when I added the new footprints back to the layout, I managed to mess up the orientation of J0, the internal MTX edge connector. This should have been the mirror image of J10, the external connector, but I forgot to "flip" it. This means that the left hand side edge connector is unusable on the V1.1 PCB. This error will be connected if I ever get another run of MAGROM boards done, but this is likely to be some way off, if it ever happens at all. As I was (overly) confident that the Version 1.1 PCBs would be fine, I ordered up a double batch on the basis that this was very likely to be a last time buy. The good news is that this is only a minor issue, the board can still be mounted either internally or externally, but the choice of which has to be made when the board is assembled - it is no longer possible to swap it between internal and external as the design was meant to accommodate. 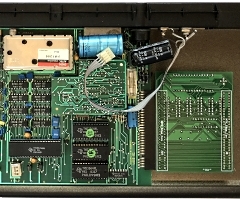 When assembled for external mounting, the edge connector is fitted under the board, with the component side of the PCB facing upwards as was the case with the original PCB. When assembled for internal mounting, the edge connector is fitted on the top side of the board. There is a slight cost benefit for buyers though, on the original version, all of the boards were assembled with the external connector fitted as standard and users opting for the internal version had to pay for the second connector to be fitted. Since the internal fit of Version 1.1 doesn't use an additional connector, the prices for the external and internal versions will be the same. The PCB must be inverted, i.e., with the component side facing downwards to install the PCB internally. Close up of the Version 1.1 PCB installed internally. The only real downside of having the board upside down is that it needs to be removed to reset the jumpers, but that is only likely to be a one-time operation unless the machine's RAM size was changed or a REMEMOrizer was fitted after MAGROM was installed.